GENOA -- The Consortium set up and led by Ansaldo Energia, a company based in this northern Italian city, in collaboration with FATA, part of the Danieli Group, has successfully completed the construction of the second electric power plant in South Africa, energy company sources said Thursday. 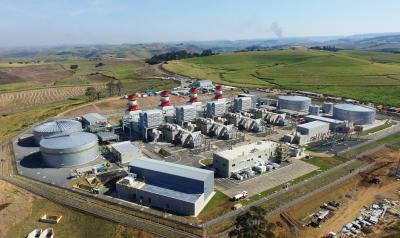 The plant, located in Avon, near Durban, forms part of the “Peakers Project”, an initiative promoted by the South African Energy Ministry and assigned to a Consortium led by Engie as an Independent Power Producer. Ansaldo Energia and FATA, due to their collaboration in the framework of this project, have been awarded the contract to build two electric power plants, fitted with gas turbines and generators produced by Ansaldo Energia. The two contracts are worth a total of 420 million euros. Power is generated at the Dedisa and Avon plants by Ansaldo Energia gas turbine, two in the former and four in the latter, in an “open cycle” configuration and fuelled using fuel oil. Both plants are prepared for a possible future conversion to a “combined cycle” fuelled by natural gas, as part of the government’s planned introduction of natural gas to South Africa. The 342 MW Dedisa plant in Port Elizabeth -- the first of the two -- became fully commercially active in Sept. 2015, and less than a year later, the second 685 MW Avon plant also came into function. Other key factors in the successful construction of the plants were the Consortium’s management of the South African construction companies involved, and its particular focus on local communities and the projects’ environmental impact. Ansaldo Energia was also awarded the contract for the maintenance of the gas turbines for a period of fifteen years. These results represent an opportunity for Ansaldo Energia and FATA to consolidate their presence in South Africa and to work towards playing a key role in future power generation investments in this country and other Sub-Saharan African states.